Stephen Charrier, President of Rollerblade USA, and Rob Gill, of InlineSkates.com, review the 2015 Rollerblade Twister 80 LE Urban Inline Skates. Hey, welcome to the Daily Spin. I'm Rob from inlineskates.com joined today by Steven Cherrier - president of Rollerblades. Steven, thanks for being here. Thank you for having me. So, we've got a really cool skate here. It's a Limited Edition skate, the Twister LE. A similar skate to the Twister 80 with maybe 1 or 2 small changes to it. What's kind of the first thing with this skate? Well, the first thing is the color. It's a red translucent shell with a white cuff. It really stands out and it's a different look. Twister has been a traditional black skate forever with some sort of other little color to it so this is the biggest change to it. Absolutely. And now, so this is a molded shell on the boot. Talk a little bit about what that provides you. All Twister skates or all molded skates basically, the reason why they're still used extensively in urban skating is the transfer of energy is really strong on a molded skate so it's holding your foot really well and that energy you put into your stride really translates right to the frame and you get a lot of power out of these skates. Awesome. And then still getting some nice ventilation too in the molded shell. You can see here it's very ventilated. The shell's really cool too because it is a translucent red so you can kind of see through it. Absolutely. And moving down the skate a little bit. The Supreme 80 wheels and an extruded aluminum frame. Yeah, so this is the Hot Rod 243mm frame. It's a shorter frame, makes the skate maneuverable. It has racing axles to it. And then the Supreme Wheel, you know, it's an urban profile wheel, you can see that it's more full-rounded like that so it corners really well. Gives you a really good performance for what it's intended as far as being maneuverable. Awesome. And then also the SG9 bearings in there too provide a nice smooth roll. Yeah, this has an SG9, an upgrade to the bearing too. Perfect. So, who is the customer for the Twister LE. You know, a Twister like all Twister skates it's pretty much anyone can skate in a Twister skate. We design it for being a fast, maneuverable, kind of urban city type of a skate but what we find is that they're the utility skates. Anyone can use them and you can skate anywhere with them. Perfect. 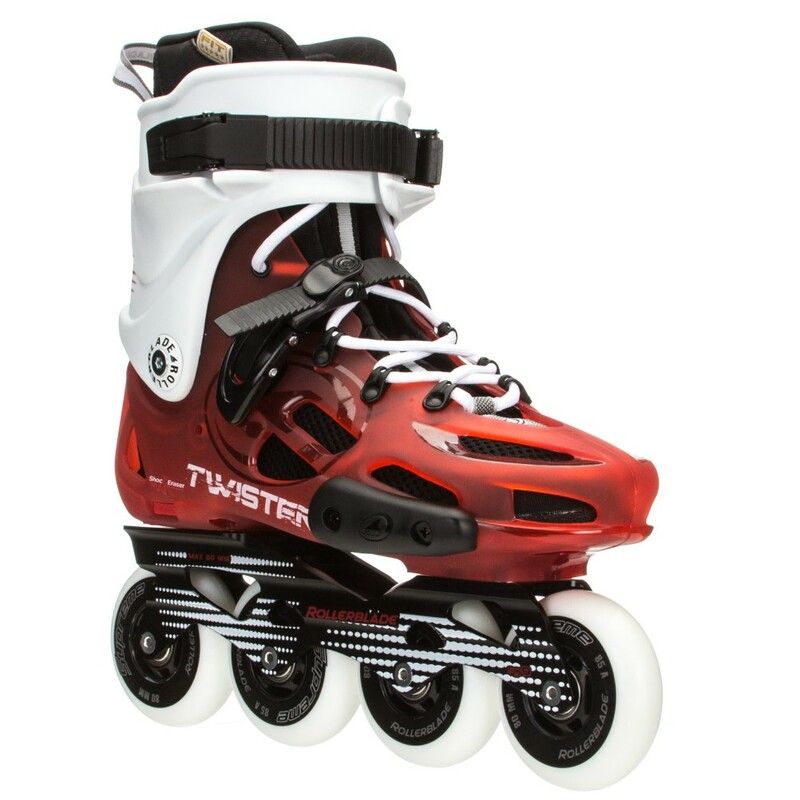 So, there you have it - the Twister LE from Rollerblade. Thanks for joining us on the Daily Spin and you can check it out on inlineskates.com.